I left Radisson SAS Royal Hotel eager to find a better hotel. I had booked two nights at Bergen Travel Hotel, a small newly redecorated hotel close to Torgallmenningen , Bergens main street. 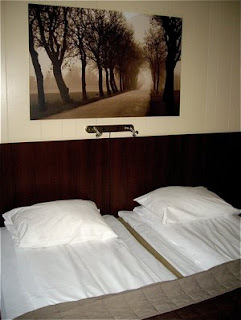 I had managed to get a double room for NOK 790 per night (Around 100 EUROS). 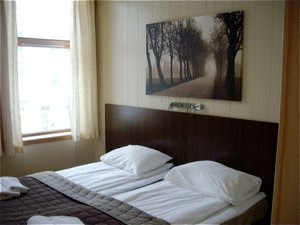 Bergen Travel Hotel provided a decent honest experience, and I have no problems to recommend it for visitors to Bergen. 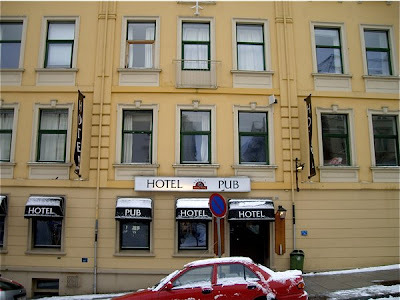 The hotel is located in Vestre Torggate very close to the heart of Bergen. 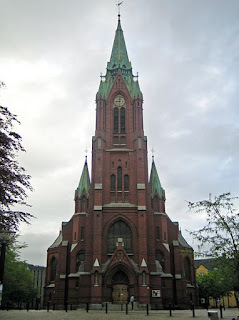 It is a steep city street leading up to Johanneskirken, a red brick neo-gothic church. Vestre Torggate is close to bus stop from / to Bergen airport (nearest bus stop - Radisson SAS Hotel Norge). Overall good and polite service at reception and in bar / breakfast room. We were supposed to check out at noon, but were able to keep our room until 2 PM. A nice gesture when our plane were to leave at 7 PM. We were offered a decent sized bedroom and a medium sized bathroom. There were two comfortable beds and a small desk. Good storage space. Pleasant colour coordinated designer style interior. As it was newly redecorated it was reasonably well maintained. There were however one bruised closet door, and the wooden laminate floor (or vinyl) had been slightly damaged during the redecorating process, but thank God for the floor itself after the carpets at Radisson SAS Hotel Royal. A little dust on picture frames and mirrors. Extra accessories - TV and hair dryer. 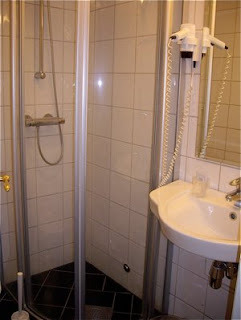 The bathroom was immaculately well maintained with an elegant shower door in glass, with white and grey tiles. Breakfast was served in the inhouse pub. It will cover most of the needs of a hungry traveller until lunch time. Good coffee, tea, and juice. Yogurt and cereal for the health conscientious tourist. Bake off white and brown bread and toast. Scrambled and boiled eggs, but no bacon or sausages. A smaller selection of sliced cheese and meats. Portion packages of jams and other spreads. This is not the hotel for those with high expectations. There is a nice indoor bar on the ground floor shared with the locals. Turning into a sports bar during the evening it was a little bit noisy for my taste. No inhouse fitnessrom, pool or SPA available. Good ventilation, free WIFI zone, and one free PC in reception area. Bar may be used as resting area during day and evening time. Bar and reception area were reasonable well maintained and cleaned. Recommended at the www.hrs.de rate. Good bargain at a very decent price. When booking at full rate the hotel would get a mere BBB+ rating (3,52 points). La Bec Rouge, Hampton Beach N.H.